My eldest fell over in a shallow pool when he was about 2yrs old, I was right next to him at the time, he was splashing and laughing and then slipped, he was only under the water for a matter of seconds but that little incident scared him, after that he wasn't so keen to get back in the water. Since then our journey of getting him to love swimming has been a bit up and down but now with his 7th birthday fast approaching it's all changed, he much more confident and has mastered swimming under the water, jumping in and swimming unaided its made for a fun and splash filled summer. Learning from the things that have and have not worked with our eldest we have approached the topic of swimming in a different way with our youngest who at 2.5 and absolutely loves it and together we now have two boys who are equally enthused about the water as I am and it's becoming a family activity we can all do together. So I thought I would share my tips on encouraging your kids to love swimming. My youngest has been doing toddler swimming lessons for the past few weeks and loves it, he is already starting to learn essential skills and can kick, lie on his back and hold onto the side. I know he will go from strength to strength and I wish we had done this with my eldest. I find personally when it comes to new things that children often respond better to someone they don't know. I am a very strong swimmer, having grown up in South Africa and done spring board diving to National level I felt I had the skills to get him started but it was harder than I thought. 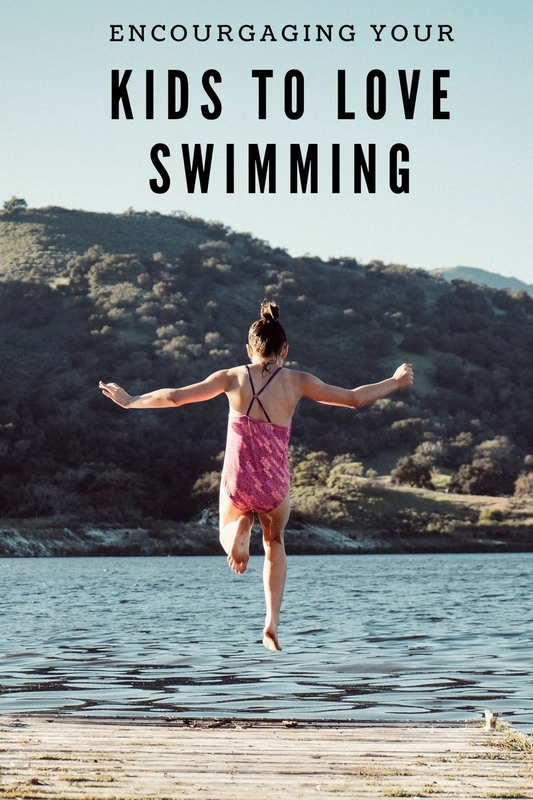 As parents we naturally want to protect our children when they are nervous but this can hold them back from taking the plunge and break through the barrier of being nervous around water. Investing in at least a couple of lessons to get them started is a very wise choice, group settings also often help as friendships are made and they often want to learn at the same pace as their friends. 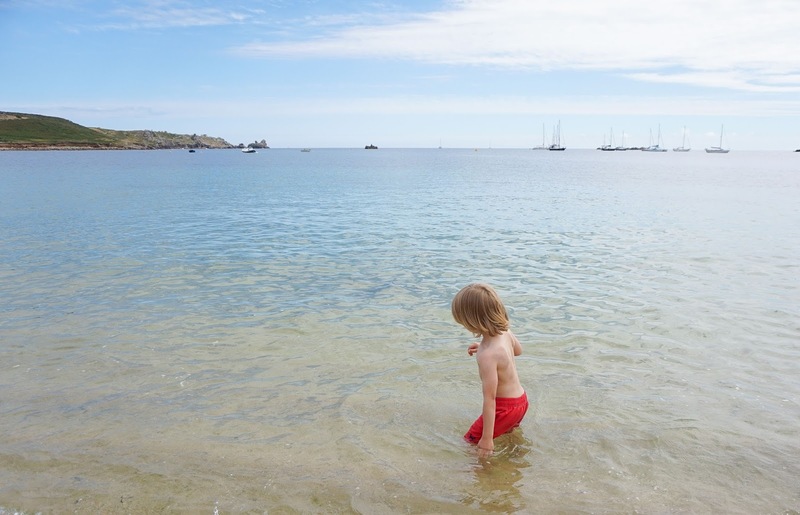 Swimming and water confidence should be all about fun, sometimes public swimming pools can be daunting for children but the beach is usually always a hit. Having safe and supervised fun in and around water really helps to build confidence so a trip to the seaside and getting your toes wet is a great family day out that will help build a love for water with your kids. Check out my post on being beach ready with kids. 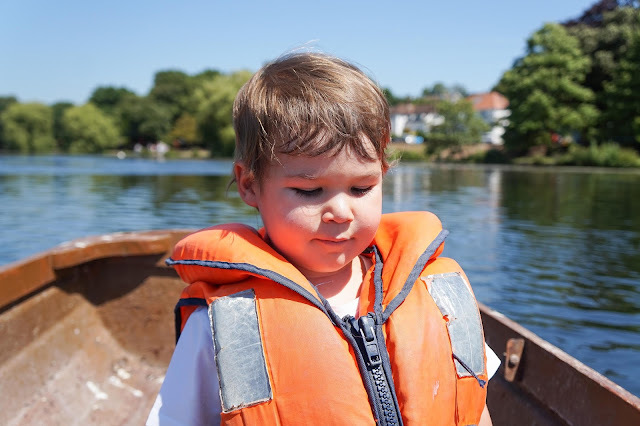 This summer we really embraced getting on the water as much as possible, whether that be on a peddle boat on Roath Lake, rowing around an river island at Rode Gardens or doing a canoe safari at Llanelli wetlands its a great way to gain confidence as well as respect for the water and learning a new skill. Yes it's coming to the end of Summer but as we all know the British Weather is somewhat unpredictable and I wouldn't be surprised if we have another warm blast before Autumn sets in. As with most parents we embrace these warm moments to the fullest and that means hours in the garden and paddling pool time. Bring out some toys, water balloons and make it fun if you have a child who is nervous of water. Of course always supervise your kids around paddling pools. Children will often lead from example, if your not keen to get into the pool they won't be either. Luckily both John and I love swimming but I have found myself recently in a real need of a decent swimming costume especially when it comes to taking my toddler to his lessons. I did a lot of swimming while I was pregnant but that meant my swimming costume became stretched and lets just say not very flattering at all and my bikini is not really suitable for swim classes. Its my birthday soon so I am going to invest in a new swimming costume that is practical but also stylish and I am loving these four at the moment. We had an incident with our eldest when she was around 2, but thankfully it hasn't affected her and she loves being in the water. Splashing about and getting used to the feeling of being in the water and what your body can do is so important, and great fun too. I totally agree with this - my daughter just did a crash course of swimming lessons over the summmet and it was the best thing we could have done for her - her confidence in the water has sky rocketed! We started aged 3 with our eldest child and it became clear after six months of lessons that she was never going to be happy about it. We left it until she was 7 and showed a new interest. This was absolutely the right choice. She's 15 now and still a member of a swimming club! Good advice, my daughter was so scared of putting her face in the water but swimming lessons have really helped and this holiday she spent most of her time jumping in!